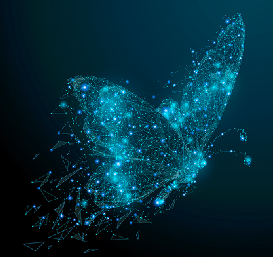 Deloitte predicts that as insurers prioritize digital transformations with a focus on continuous improvements, they will grow top- and bottom line results,[i] -but managing change to ensure a butterfly-like metamorphosis remains a challenge as insurers strive to gain access to the resources they need. According to Peacock, ongoing discussions are key to gaining support for digital transformations and then keeping business stakeholders aligned to the goals of the initiative, but require more than technological expertise. "You've got to have people that can step up and talk about new technologies and how you can make them relevant to driving business change," says Peacock, highlighting the need for IT professionals who can speak to business outcomes and not just about technology. Digital transformations impact people, process and technology across the organization, changing how business is done and redefining new roles and responsibilities, so aligning leadership to the goals of the initiative is critical to success and is the first step to managing change. Legacy technology is a weak link for insurers as siloed operations result in an inconsistent customer experience. Core systems replacements aren’t the answer as they create further interdependencies. Change at this scale is also costly, takes years to implement, and by completion, results in another new operational silo. Digital platforms solve for this by uniting back-end systems, enabling rapid implementation and providing a central vantage point to all core system siloes, but according to Rauschenberger, initiatives like this change how the organization does business. Tom Hammond, President of U.S. Operations at BOLT, provides further insight into the impact on insurers. As insurers unite silos, agents benefit from increased efficiency, but need to be trained on new systems, processes and digital tools to realize the benefits. Rauschenberger says how organizations plan for and manage changes like these is a primary component of digital transformation success. As processes evolve throughout digital transformations, organizations realize greater efficiency, resulting in changes to existing job functions and roles. Consider the typical quote-to-issue lifecycle as an example. Under a digital model, the entire process is automated, bringing greater operational efficiency, but changing roles and responsibilities within the organization. According to McKinsey, top IT professionals tend to be drawn to leading technology firms or startups, making it difficult for insurers to find and hire critical team members to support transformations. [viii] This shortage of talent puts a greater emphasis on retaining skilled employees, while maintaining the insurer’s reputation as a desirable employer to attract new resources. According to Working Transitions, an organization of change specialists, unsuccessful digital transformations put the company’s professional reputation at risk as employees past and present express their feelings on social media sites, such as Glassdoor. They found that 56% of workers read reviews from employees before applying to or accepting a role with a company, and more than half rated their organization poor or extremely poor when it came to managing transitions. [ix] In an industry where attracting talent is already difficult, negative reviews can adversely impact an insurer’s ability to attract and retain the right resources. To gain access to the talent they need, 40% of insurers are investing in partnerships with third-party vendors. [x] Partnerships with InsurTech providers form a growing number of these relationships as these digital pioneers easily attract innovative professionals and provide insurers with transformation leaders who are experienced in managing change. Breading also reports that distribution is a hot area for InsurTech. [xii] Digital platform providers are part of the early InsurTech movement and have garnered top talent for key roles. These professionals employ their experience across multiple implementations to help insurers avoid pitfalls as they integrate digital capabilities with traditional channels of engagement. According to Peacock, digital transformations are about more than technology implementations. Companies should be looking to fundamentally change how they deliver their products and services, and according to Brian Solis, principal analyst at Altimeter Group, that takes more than implementing technology to succeed. When insurers take on digital transformations alone, they have to think of every implication that the transition will have on the business and ensure the alignment between people, process and technology. If an insurer hasn’t aligned technology across the organization to create a seamless cross-channel experience, consumer satisfaction suffers. Ensuring that processes and people are aligned to account for the greater efficiency bestowed by digital capabilities is also key. Because digital automates much of the quote-to-issue lifecycle, functions associated with selling and underwriting policies suddenly become much more efficient. As a result, job roles and responsibilities are likely to change, and insurers need to understand the best way to evolve those positions to achieve the greatest benefit. A primary reason that insurers are seeking relationships with digital platform providers is to better manage changes like these. Seasoned platform providers ensure access to experienced professionals to guide transformation efforts, train existing staff and ensure alignment between technology, people and processes. Forrester found that over 60% of the insurers they surveyed were taking actions to implement online customer experiences and improve cross-channel interactions. How are initiatives like these impacting your organization, and what steps are you taking to manage change? [i] Sam J. Friedman and Michelle Canaan. “Insurers Need Strategic Shifts to Compete in a Digital World.” ALM Media. Property Casualty 360, Dec. 27, 2017. Web. [ii] “Digital Transformation in Insurance.” EY. EYGM Limited, 2017. Web. [iii] Thor Olavsrud. “Change Management for Digital Transformation: What’s Different?” IDG Communications. CIO, Aug. 3, 2017. Web. [iv] Jacque Bughin, Laura LaBerge, and Anette Mellbye. “The Case for Digital Reinvention.” McKinsey & Company. Digital McKinsey Quarterly, Feb. 2017. Web. [v] Jon Rauschenberger. “Digital Transformation: 3 Strategies to Manage Change.” Red Hat, Inc. The Enterprisers Project, May 30, 2017. Web. [vi] Sylvain Johansson and Ulrike Vogelgesang. “Automating the Insurance Industry.” McKinsey & Company Financial Services. McKinsey Quarterly, Jan. 2016. Web. [vii]“Insurance’s New Normal: Driving Innovation with InsurTech.” Global Insurtech Report o- 2017. PwC, 2017. Web. [viii] Tanguy Catlin, Rob Hartman, Ido Segev, Ruxandra Tentis. “The Making of a Digital Insurer: The Path to Enhanced profitability, Lower Costs and Stronger Customer Loyalty.” McKinsey & Company, 2015. Web. [ix]“The Digital Workplace:Developing Skills to Future Proof Your Organisation.” Working Transitions. https://www.workingtransitions.com/the-digital-workplace. [x] “Digital Transformation in the Age of the Customer: A Spotlight on Insurance.” Forrester Consulting commissioned by Accenture, Nov. 2015. Web. [xi] Mark Breading. “InsurTech and Personal Lines: Threat or Opportunity?” Strategy Meets Action, Oct. 10, 2017. Web. [xii] Mark Breading. “InsurTech and Personal Lines: Threat or Opportunity?” Strategy Meets Action, Oct. 10, 2017. Web. [xiii] Gieselle Abramovich. “Digital Transformation Involves More than Technology.” Adobe Systems, Inc. CMO, Oct. 4, 2017. Web. [xiv] Paul Lucas. “Why Auto Insurance Agents are Still Needed in the Digital Age.” Key Media. Insurance business Magazine, Jan. 25, 2017. Web. [xv] “Digital Transformation in Insurance.” EY. EYGM Limited, 2017. Web.